Gmail integration with Google Drive to archive emails is something a lot of people want. But Google doesn't provide any such integration by default. Here's an easy way to archive all your emails in any label to your Google drive using Google scripts.All emails will be archived as PDF files in a folder called "Gmail backup" in your drive. First open this "Gmail archiver spreadsheet" and select File->Make a Copy. This will copy the spreadsheet to your Google Drive. Just wait for the sheet to fully load and the "Gmail Drive Backup" menu to appear. It may take a few seconds depending on your internet speed, so please be patient. 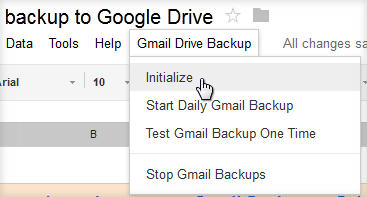 Select "Gmail Drive Backup" menu, click "Initialize" and grant the permissions required. Now select "Gmail Drive Backup" again and click "Start Daily Gmail Backup". You will be asked to enter the Gmail Label you want to archive. 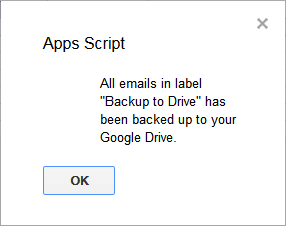 That's it, the script will now convert your emails from that label into pdf files and move them to a new "Gmail backup" folder on your Google drive. Attachments also will be moved. The PDF email will also have a link to the attachment stored in your drive which you can download any time you want. You will also get a confirmation message once done. Option to test out one time or doing regular daily archivals. All mails are stored as PDF files with the original html/css styling intact. That means the PDF version in your Google drive will look exactly the same as the original mail. Every time an archival is done, the details get updated in the spreadsheet. You can open it any time to see what was done. Attachments are also archived to Google drive and links to attachments inserted in original mail for easy download. 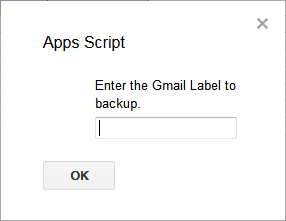 Regular backups can be stopped any time using the "Stop gmail backups" menu. The only limitation is that images which are embedded as external links won't appear in the PDF version. All other images and attachments will remain in tact. But usually this only applies to mails like email newsletters. Also note that the archival is one directional. That means mails archived to Google drive can not be brought back to Gmail in the form of the original Mail. So use this only for emails you want to store on your drive and don't want on Gmail. Here's a working video of the script in action. Also See: Auto Delete old Emails in Any Gmail Label. Lovely little script. Thanks for sharing it! but no any attached files create on my google drive, please advise. Google docs do not take up any space in Google Drive! I am keen to find an add-on or a Script which allows for gmail messages and attachments to be saved into Google Drive in 'Google doc' format. Any ideas whether such a script exists? Hi Fabien, as far as I know, such a facility does not exist. You could write a script which reads content from the email and creates a text document out of it. But that would be error prone as 99% emails will be in html and you can't get the formatting right. Google had even added such an experimental feature in Google labs earlier, but seems to have withdrawn it later on. That's the reason to use pdf format in the first place. Great Script, is there any way of doing this and NOT removing the email from Gmail. Hi KC, that is difficult to do as keeping checkpoints for backedup emails is something not really possible to do with Google script. I have to say, what a great application! I ask this since I am at 91% full in my Gmail and and am transferring many e-mails to my Google Drive (approx 50K!). Hi Arun, I had a brain fart and renamed the folder that it was saving to. Now, of course, I've broken the script. Any quick tips for repairing it? Thanks. Great script. I extended it slightly. I hope you don't mind, but I made the following additions. 1) I did this so I could make additional copies for other labels and drives. 2) I wanted shorted names for Google Drive Sync. 3) I wanted to create a sub-folder for each subject. 4) The pdf extension (.pdf) was not being added to the email file. That is not a problem in Google Drive online because the MIME Type is set, but It is required for Windows to recognized the file properly for the Offline Google Drive. 5) Finally, I added another menu option to incorporate testing of changes to the Spreadsheet. Hi Rusty - how can I access your extended script? I would also like to make additional copies of other labels and drives. I'd also like to rename the folder that the pdf email copies download to. I have the same question as SamyMH. Arun is this possible? Hi Rusty - I would also like a copy of your extended script. I need a different name for the target folder the back will go to. Thank you! Thanks for sharing... Good to know this.. Here I would like to share another simple E-mail backup tool called Beyond Inbox. It is a cross-platform based application providing the email backup taking service to users. It can back up, copy, move and restore email messages of your IMAP account (including Outlook, Yahoo and Gmail backup). It works on all the OS including MAC OSX, Linux and Windows. This looks great and like exactly what I am looking for, however, it isn't working for me. When I follow the process, I get an error that alernates between English and French which tells me that the label doesn't exist, or "ReferenceError: L'élément "DocsList" n'est pas défini." I have tried changing the name of the label several times, but the issue persists. I did notice that the language now reads "Start daily gmail archive" rather than "Start daily gmail back up". I don't know if this has anything to do with it. Any help you could provide would be welcome! Archive emails in any Gmail label to your Google drive as pdf files easily with this trick. This includes email and attachments as well.